Describing the activities of foreign intelligence agencies as malign foreign influence operations, like Moscow's program to interfere in the 2016 presidential elections, Rosenstein outlined several methods being used against what he termed "information warfare" against the United States. "Influence operations are a form of information warfare," Rosenstein told a security conference in Aspen, Colo. "Covert propaganda and disinformation are among the primary weapons." The new focus on counter-disinformation activities is outlined in a Justice Department task force report made public Thursday addressing both cyber attacks and information threats facing the United States. The comments by the deputy attorney general and the report calling for aggressive action against foreign disinformation marks a major policy shift for the U.S. government. Since the 1980s the FBI has been tasked with countering foreign disinformation operations. But both the FBI and Justice Department took little action against foreign disinformation under successive administrations since the demise of the Soviet Union in 1991. That appears to have changed after the Russian election meddling operation that Rosenstein described as a "hack-and-release" operation. Russian government hackers and intelligence agents conducted cyber attacks and then publicized the stolen information, such as data obtained from the Democratic National Committee and leading political figures. The problem, however, extends beyond the Russian operation. The goal of foreign influence operations is to destabilize society and undermine confidence in democratic institutions, impacting political sentiment and public discourse to achieve strategic geopolitical objectives. Much of the report focuses on Russian active measures that have been underway against the United States for decades, dating to KGB disinformation operations under the Soviet Union. However, technological advances and the heavy reliance of current society on information tools have enhanced foreign information attacks, the report said. The Russian operation targeting the 2016 election combined covert intelligence operations, including cyber attacks, with overt propaganda activities by Moscow, state-funded media outlets, third parties intermediaries, and paid social media users known as internet trolls. "The threat such operations pose to our society is unlikely to diminish," the report warns. According to the report, cyber attacks on election infrastructure, political organizations, and politicians, and covert action to undermine political campaigns are among the methods. A major tool is covert disinformation designed to influence overall public opinion and sow discord in American society. "This could happen in isolation or in combination with other operations, and could be intended to foster specific narratives that advance foreign political objectives, or could be intended simply to turn citizens against each other," the report says. Foreign influence operations also employ lobbyists and foreign media outlets in order to influence American policymakers and the public. The Justice Department is using its investigative power to disrupt foreign influence operations, including FBI counterintelligence probes. The investigations can lead to criminal charges, such as prosecutions of unregistered foreign agents, as well as public exposure and informing targets of foreign information attacks, such as social media companies. Financial sanctions against foreign officials involved in disinformation operations also are being used. The Trump administration earlier this month indicted 12 Russian GRU military intelligence officers who were involved in the 2016 election meddling operations. Earlier indictments targeted a Russian internet troll farm in St. Petersburg, Russia. Critics have said the use of such legal measures is unlikely to end the disinformation campaigns. 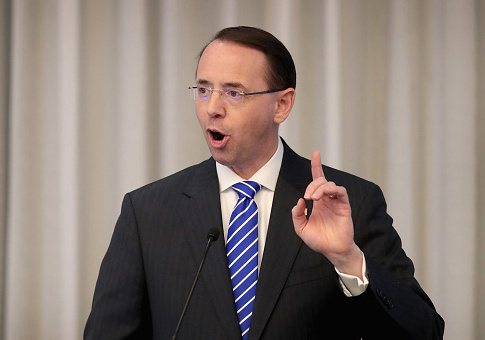 Rosenstein said the critics are shortsighted because those indicated could face trial in the future if there is a change of government or if they visit a nation that could extradite them to the United States. "Do not underestimate the long arm of American law—or the persistence of American law enforcement," he said. "People who thought they were safely under the protection of foreign governments when they committed crimes against America sometimes later find themselves in federal prisons." Indictments targeting information warfare practitioners also can be a deterrent and limit future information and cyber attacks. "Wanted criminals are less attractive co-conspirators," Rosenstein said. Targeting information operations with indictments also helps the public to better identify disinformation by providing court-level evidence, and can also vindicate victims of the operations. Also, criminal investigations can be used to support other penalties for those engaged in foreign influence operations, such as Treasury Department sanctions, which have been a key element of administration national security policy. In addition to targeting Russian influencers, the Justice Department also indicted Iranian hackers involved in an attempt to break in to the industrial control network for a dam in upstate New York, and Chinese military hackers behind operations targeting both U.S. government and private sector networks. "That is why our government regularly files charges against criminals who hide overseas, such as Iranian government hackers who broke into computer networks of a dam; Iranian hackers who infiltrated American universities, businesses and government agencies for the Islamic Revolutionary Guard Corps; an Iranian hacker who infiltrated and extorted a television network; Chinese government hackers who committed economic espionage; and Russian intelligence officers who stole data from an email service provider," Rosenstein said. Rosenstein made no mention of extensive Chinese government influence operations that have aggressively targeted both the government and private sector. Beijing engages in sophisticated covert influence operations designed to support China's policies and play down the communist government's operations, such as the massive theft of American technology. FBI Director Christopher Wray earlier this week described Chinese intelligence operations targeting the United States as "the most significant threat we face as a country." Rosenstein noted Moscow's past use of disinformation operations against the United States. They included publication of a book in 1963 falsely claiming the FBI and CIA assassinated President John F. Kennedy. Another Soviet-era disinformation operation, targeting the developing world, included publicizing in 1980 a forged document asserting the National Security Council had adopted a strategy to prevent black political activists from working with African leaders. Also during the Reagan administration, the KGB spread false stories that the Pentagon secretly produced the AIDS virus as part of a biological weapons program. To counteract the disinformation, the Reagan administration created the Active Measures Working Group, a CIA-supported group of experts who investigated and exposed Soviet disinformation. "Modern technology vastly expands the speed and effectiveness of disinformation campaigns," Rosenstein said. "The internet and social media platforms allow foreign agents to spread misleading political messages while masquerading as Americans." Rosenstein said a former Russian internet troll involved in the election disinformation effort said Americans were more susceptible to influence operations because Russian audiences and publics in other repressive regimes are wary of government disinformation. "We live in a country that allows free speech, so people are accustomed to taking it seriously when other citizens express their opinions," Rosenstein said. "But not everyone realizes that information posted on the internet may not even come from citizens." Automated "bots" also can magnify the impact of foreign propaganda. Software is now used to mimic actions by human users that help disseminate fake information. "Together, bots and networks of paid trolls operating multiple accounts allow foreign agents to quickly spread disinformation and create the false impression that it is widely accepted," Rosenstein said. Rosenstein said a strategic approach is needed to better counteract foreign disinformation including actions by the Department of Justice, Homeland Security, State, Defense, and Treasury, along with intelligence agencies. The deputy attorney general also called on technology companies and other sectors of society to take action to counteract foreign influence operations, noting, "citizens need to understand the playing field." "The days when foreign criminals could cause harm inside America from remote locations without fear of consequences are past," Rosenstein said. "If hostile governments choose to give sanctuary to perpetrators of malicious cybercrimes after we identify them, those governments will need to take responsibility for the crimes, and individual perpetrators will need to consider the personal cost." Rosenstein noted that countering foreign disinformation must seek to avoid impinging on First American freedoms. "But that does not leave the government powerless to address the national security danger when a foreign government engages in covert information warfare," he said. "The First Amendment does not preclude us from publicly identifying and countering foreign government-sponsored propaganda." Congress over the past year has passed three laws that encourage the administration to investigate and counter foreign disinformation operations. Rosenstein said Americans need to become better educated about attempts by foreign states to influence political debates. "Foreign governments should not be secret participants, covertly spreading propaganda and fanning the flames of division," he said. Efforts to deal with cyber attacks, both criminal and intelligence, include seizing or disabling servers, domain names, and infrastructure used in attacks. Underground internet markets used by hackers and criminals also are being shut down, and control over hijacked networks can be restored. "Our government is doing more now than ever to combat malign foreign influence and other cyber threats," Rosenstein said. This entry was posted in National Security and tagged Department of Justice, FBI, Rod Rosenstein. Bookmark the permalink.